Media captionHow far will these eagle chicks spread their wings? A long-awaited project to boost the population of golden eagles in the south of Scotland has taken off. Three young golden eagles have been released into the wild at a secret location in the Moffat Hills. They were moved from nests in the Highlands where the majority of the birds are usually found. The translocation project hopes to increase the number of golden eagles in parts of the country where they have become an increasingly rare sight. Fewer than five breeding pairs exist in the south of Scotland with none in England or Wales. The BBC was given exclusive access to see the young birds ahead of them taking flight for the first time in one of the most significant reintroduction projects ever under taken for a large predator. It is hoped people from the south of Scotland, northern England and even Wales will have the chance to see this iconic bird in the coming months and years. In the first of a series of groundbreaking translocations, conservationists working for the South of Scotland Golden Eagle Project have successfully transported three chicks. After being examined, measured and then fitted with a satellite transmitter to track them when they take to the skies, they were released into the Moffat Hills. The birds were only handled twice - once when they were removed under licence from their nests and when they were checked over and tagged before being released. The £1.3m project, hosted by the Southern Uplands Partnership, is now calling on volunteers across the south of Scotland to support project staff and Scottish Raptor Study Group members in monitoring and recording sightings of the birds. The chicks were named by local schoolchildren as Edward, Beaky and Emily. RSPB Scotland, Scottish Land & Estates, Forestry Commission Scotland, Scottish Natural Heritage, and Buccleuch and the Southern Uplands Partnership, have been working together for more than 11 years to bring the project to fruition. Prof Des Thomson, principal advisor for science and biodiversity with Scottish Heritage, told BBC Scotland: "This is the icon of wild Scotland. We are on the threshold of giving something very exciting back to the south of Scotland. "Scotland has just over 500 pairs, just two to four breeding pairs in the south of Scotland where they are really struggling. "Young golden eagles are heavily persecuted. A third of them have been killed either through shooting or poisoning." He added: "Down here in the south of Scotland we've been able to reassure ourselves persecution is not an issue. It's just a small fragmented population that needs this helping hand from us. The birds are so "precious", they will be monitored and supported long after their release. Each released golden eagle is satellite tagged to ensure the project team builds up as much information as they can on the ranging behaviour, survival, and health of the birds. Cat Barlow, project manager for the Golden Eagle Project, said: "This is very significant. "We are trying to boost the dwindling population and make sure that we are seeing a bird that should be here in the skies of the south of Scotland. "This will be their first time out of the aviaries. They may fly a few metres, they may fly a hundred metres up the valley. We don't really know yet. "But we've chosen a spot where there's lots of different sites where they can rest and perch - rocks for them to sit on, things like that. "So hopefully they will fly out into the valley, find somewhere to settle, and in their own time get up into the skies and explore." Speaking about the project, Scotland's Environment Secretary Roseanna Cunningham said: "Golden eagles are one of Scotland's most impressive species and many people - myself included - will be excited by the increased opportunity to see these magnificent animals in the wild. 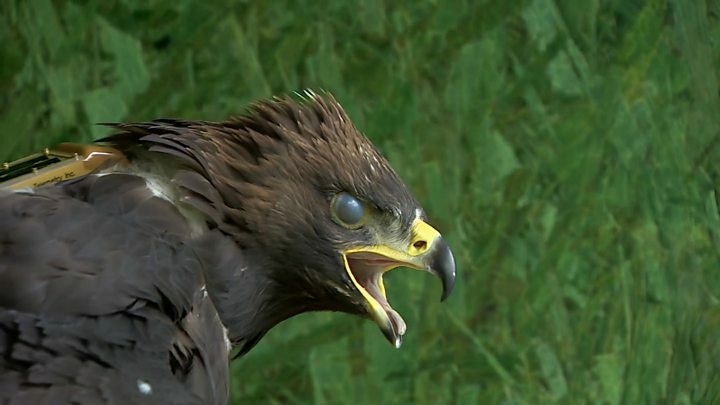 "In bolstering golden eagle numbers in the south of Scotland, the project will add to the biodiversity of the area, as well as potentially attracting more visitors - with the accompanying economic benefits that brings." Video How far will eagles spread their wings?